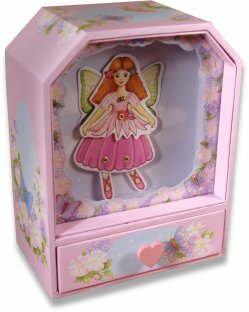 A beautiful musical box perfect for girls, with an angel that dances to the music when the front drawer of this music box is opened. This musical box is made from a wood board covered in a printed paper with colourful pink designs. 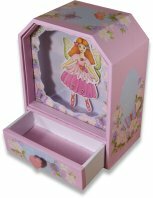 The music box is fitted with a clockwork musical movement wound by a key at the back of the box, the small drawer at the front opens to make the music box play and the little angel figurine moves to the music in a jiggiling manner. The musical theatre plays the tune 'Music of the Night'. IMPORTANT NOTICE - Please be aware that although these are childrens music boxes and the components inside are well sealed, they do contain small parts and a removable metal key. Therefore, they should never be considered suitable for very small children or babies. If you are unsure about suitability, please telephone and ask one of our staff for guidance.